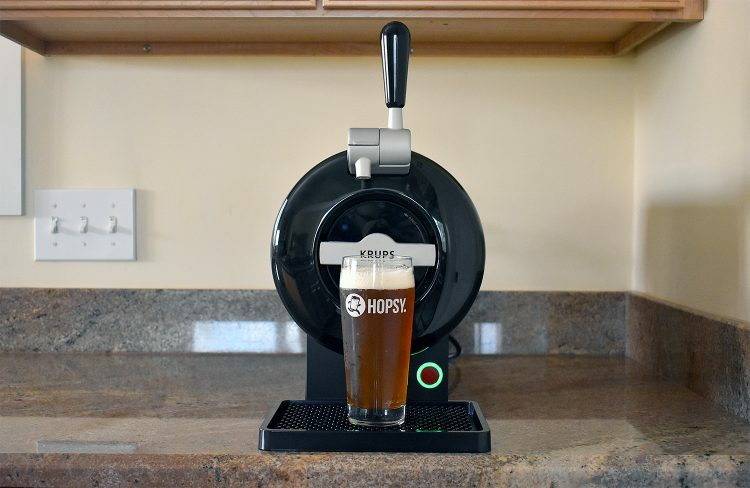 Hopsy is a really innovative product for any beer lover. While it may not replace bottles and cans entirely from your lineup, Hopsy has a great line-up of breweries to select from and the tap system is perfect when inviting a few friends over. $140 off a new system. The wonderful and ever tasteful craft beer industry is reaching unprecedented heights as technology opens new and exciting doors of the brewing world. Automated brewing machines, such as Pico Brew, completely automate the brewing process, making homebrewing less intimidating for newcomers. 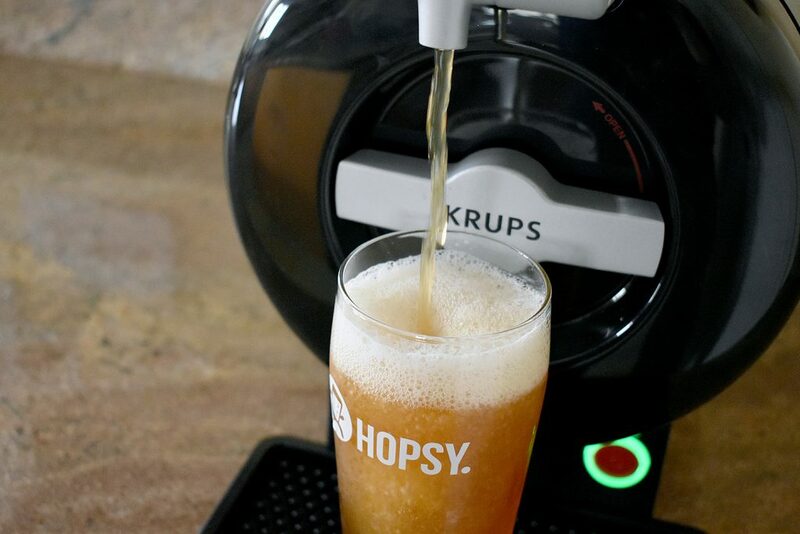 A more recent entrant to this “brewing tech” market is Hopsy, which aims to deliver fresh on-tap beer directly to your home. We got our hands on one of these bad boys to test out. SUB: This is the draft system. It’s a compact appliance that sits on your counter (or anywhere else in your home) and plugs into a standard electrical outlet. 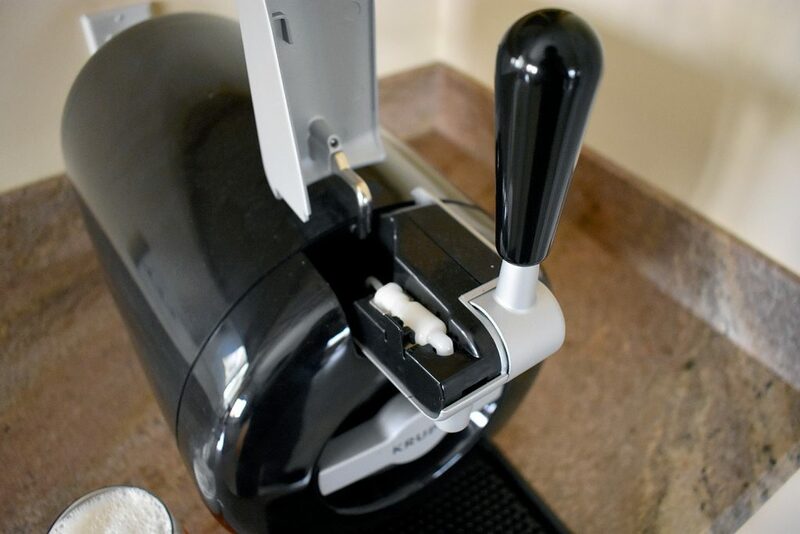 The SUB Draft System holds the beer in place, keeps it cold, and of course, has a draft handle to pour. TORPS: This is the beer. Beer is delivered in 2 liter containers and you have the option of joining the monthly beer club for discounted pricing or purchasing individual beers. The TORPS are placed directly inside of the SUB Draft System and connect to the tap. Before you get worried about these being only 2L – remember that this isn’t like a regular tap system. Swapping an empty TORP out for a new one takes seconds. 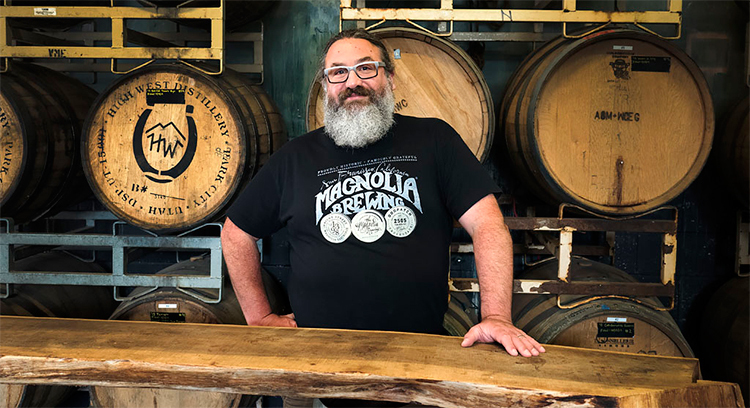 They have some pretty big names in the brewing world as partners as well, including Sierra Nevada, Lagunitas, Ommegang, and Heineken, among many others. Depending on where you live, the availability selection can change. But one of the most beneficial aspects of Hopsy is being able to obtain fresh (and sometimes limited release) beer from breweries you may not have regular access to. This was a bit of a surprise for me, as I thought this system was going to cost a lot. The SUB Draft System typically retails for $179.99, but they often have a $100 discount for new customers (here is a coupon link). As for the beers, they typically run $14.99 for 2 liters with the Club Discount. Setting up the Hopsy system is ridiculously easy. Plug the SUB Draft System in and press the power button. The button will light up red as it begins cooling and will turn green when it’s ready to add beer. The manual said it can take up to an hour but it only took about 25 minutes for me. Once the light turned green, I pulled the cap off of my TORP (Gun Hill IPA for the first test. I also refrigerated the TORP beforehand.) which has a little hose connector sticking out of it. I opened the hatch on the SUB, loaded the TORP (pretty interesting names they picked, huh? ), connected the tap lines, and closed the hatch. And now we are ready! Once you begin pulling the tap, you might be caught off-guard by the noise that it makes after 2-3 seconds. This is the pump activating to maintain pressure in the tap – so it’s completely normal. I tilted my glass 45 degrees and poured, only to be surprised by the amount of foam (nearly 50%). I figured this was due to the warm tap lines hitting the cold beer, because after the second pour, while still a little more than a typical bottle pour, the foam had decreased quite a lot. However, my second TORP poured flawlessly from the beginning, so I think the first beer I tried was an exception. Overall I am very pleased with the company and product. It won’t fully replace my urge to grab a bottle or can from the fridge after a long day, but it’s a really innovative and fun product when you have a couple of friends coming over to watch the game. But what’s possibly more important, and a reason why I continue to use Hopsy even when I’m drinking alone (#SadFaceEmoji), is the fact that you can find new limited release beers from breweries I can’t seem to find in local stores AND have it delivered to your door. How can you beat that? Here is the thing. I received a link to this product and at the top of the page are the buttons to order the product. Well, at the very bottom of this page is the fine print that says you will be in the beer club for at least 3 shipments. I feel its very deceptive and disappointing to hide this information and never once draw the customers attention to it during the order process. I also feel that is a deliberate choice by hopsy. When I complained to customer service about this after my surprise order showed up they said I had agreed to this when I placed the order and I could pay $99 to cancel if I wished. The attitude of customer service was “we have you in this contract you were unaware of and we don’t care if you stop buying our beer after the 3rd shipment, we already have your $250.” Very disappointing business practice and I will tell everyone I can about this. Hopsy is horrible. You sign up for particular beers that they say will be shipped, then they send crap beer you can get Walmart. Inventory problems are huge and there is no one to talk to. They have zero interest in customer service. I love beer so I was initially excited about this….. But let’s get into the details. A) they sign you up to a membership without really being up front about it. B) you need to be home to get the delivery because it’s alcohol and it’s not like they deliver when your around. You need to literally waste a day waiting for them. C) it’s expensive. You can just get a six pack cheaper at the market. D) the system is garbage, mine wouldn’t shut off after the first month. Like you pour a beer and put the tap back and beer keeps pouring. They offer no replacement or guarantee and I had it less than 60 days. E) to cancel the service it’s extremely hard. You need to send multiple emails to their customer service dept and wait until they get back to you. Which is B.S. because your card can get magically charged for the next/last month. Basically it’s a great idea with poor excecution. I’d be super surprised if they are around in 2 years. I purchased this product end of the 2018 and in the past 3 months I have regretted every moment since my first delivery. The day after I ordered the price dropped $50 and since has dropped even lower. You have to keep track of your “order date” on the website. There is no notification by text or email until they place the order. If you do not check the website during your order week you are stuck with what they send. If you return it they don’t refund your credit card they give you a “credit”. You would think that credit would apply to next order, but it didn’t. Forget about making a complaint; You’ll be lucky to get a response the same day. I really wanted to support local breweries but this whole project has been one of the most horrible experiences. Maybe they’ll get their act together, but while they work out their problems you are better off going to the actual breweries and giving them your money directly. This product is not worth the headache. I agree, if you buy this device, you’ll be stuck with dealing with Hopsy… and they are a TERRIBLE company. So, let me be clear — I used to love Hopsy. I have five (yes, 5!) Subs and I have referred (literally) dozens of new people. But… my opinion has changed. BE WARNED — AVOID THIS COMPANY!!! 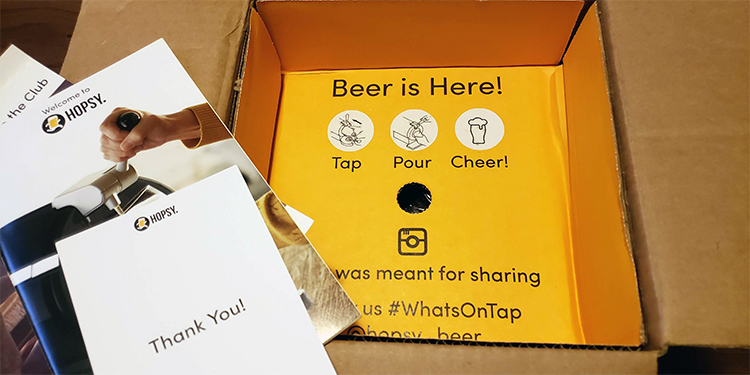 Hopsy is interested in getting new customers that they’ll sign into a “beer club”, but they are NOT interested in treating existing customers well. They’re like one of those record-clubs-from-hell that we signed up for as teenagers, and then wished that we had just stuck with listening to our parents’ 8-tracks. In a word: MISERABLE! 1. ~90% of the orders are wrong, come late, are damaged, etc. At first I though the problems were because of something I did (yes, I’m blaming the victim! ), but now I realize its a genuine problem that the company seems entirely uninterested in fixing. 2. Getting help/support used to be easy, but now it’s next to impossible. The online chat doesn’t work, they disconnected the phone number so you can’t call them (and they refuse to call out), and the agents that answer email are terribly trained and misinformed (they are trying to help, but they don’t know what they’re doing, and agent turnover is rapid so by the time they know what they’re doing they leave — TBH, I feel badly for them). I’d accuse the agents of lying, but it’s more likely that that they’re just given bad/no training and information. 2b. More than a week ago I was promised a call from a “supervisor”, and I’m still waiting for that!! 3. Claiming a credit is difficult. I tried to claim one recently and was told something like, “Sorry, you can’t claim that… no, we can’t verify that you are entitled to it or not (because we used a vendor to handle those, we don’t work with them anymore, and we don’t have their records… no, it doesn’t matter that you have proof, we don’t have proof (and we never will)… so, you’re out of luck, sorry”. 4. No one else in the US sells beer that will fit the Subs (the bottles are called ‘Torps’, and they seem to be proprietary). So, you’ll buy a Sub (or get a “free” one by joining a beer “Club” that they’ll continually renew without your permission! …be sure to read the fine print, but don’t expect that they’ll actually honor the terms!) and then be stuck with an expensive and beer-less paper weight! 5. They’ll change the terms/pricing without warning — be sure to always VERY carefully check your order before you buy! They are always finding new ways to increase the total cost. 6. At first you’ll like the Sub/Hopsy, and you’ll share your code with family and friends, and they’ll sign up. And, then everything will start going bad for you (and for your friends and family), and then you’ll feel like a complete and total jerk. 7. The beer selection keeps declining in quality and variety. I can only assume that they treat their vendors as poorly as they treat their customers, and thus they have fewer decent breweries as partners. Before long I’m afraid the choices will be either “Bud Lite” or “Coors Lite”! 8. Note the dating of the reviews here on Yelp. For a while they were positive, but nearly all of the recent ones are TERRIBLE (aside from the ones that seem to say the same things in the same ways… seems like someone is trying to scam the system!). I have never written a Yelp review before (I didn’t even have an account), but I am so angry with this company and the way they are treating me, that I feel compelled to warn other people. Buy your beer in a supermarket… ultimately, it will cost less, you’ll have better selection, you won’t have the endless aggravation, and you won’t be tempted to lure in your family/friends and then feel really terrible about introducing them to this complete cluster-F of a company.